During the late 12th century, Sikandhar Badshah, the governor of Jeddah came along with Hazrat Sultan Syed Ibrahim Shaheed Badshah to Tamil Nadu in particular Ervadi (village) from Madinah. The Madurai province was won by Badshah Sultan Syed Ibrahim shaheed of Erwadi against the king Thiru Pandiyan who refused to embrace Islam and made Hazrat Sultan Iskandhar Badshah as the emperor of Madurai. People were happy with the rule of Hazrat Sultan Sikandar Badshah in the basics of Sharia (Religious Law of Islam). King Tiru Pandyan, who was defeated, went to Tirupati, met all his friends and briefed about the invasion of the Arabs. They helped him with formation of large troop. After forming a big and healthy troop to face the Arabs, King Thiru Pandyan headed towards Madurai. Hazrat Sultan Sikandhar Badshah, the emperor of Madurai, was incognizant about this secret. He turned around of Thiru pandiyan, concentrated in expanding Islam and in the welfare of the people rather than strengthening the army. Tiru pandiyan with a strong army fought with Hazrat sultan Sikandhar Badshah razi vigorously. The poet of Sangam era describes that fight as the biggest ever war held in the pandiyan kingdom. To face the Pandiyas, the Arabs were in need of more troops. 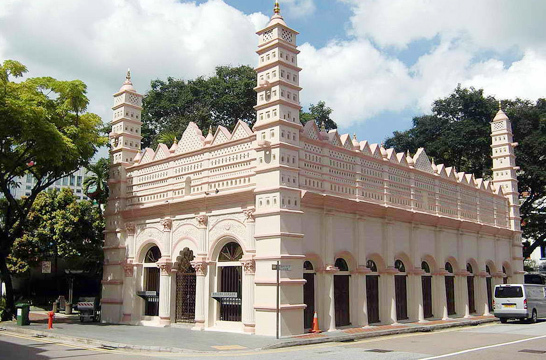 Hazrat Sultan Sikandhar Badshah sent 9 of his soldiers to inform Hazrat Sultan Syed Ibrahim Shaheed the emperor of Bouthiramanikkapattinam (now Erwadi) about the war and the need of more troops. King Thiru pandiyan sent a large number of his soldiers to stop the 9 Arabian soldiers who were travelling towards Erwadi. Hazrat Syed Salaar Sha Shaheed razi was killed at Palli chandai near Keeladi Silaiman and Hazrat Syed Ibrahim Shaheed Razi at Karserinear Sakkimangalam. The remaining 7 soldiers fought bravely and continued their journey towards Erwadi. Many Pandiyan soldiers followed the 7 soldiers and an exhaustive war held at Manamadurai. In this war, five of the Arabian soldiers called Khamsatu (Five) Shuhadaas (Anjanamaar - Paanch Peer) were killed. The remaining two soldiers tried to travel hard to convey the message to the Emperor of Erwadi. Hazrat Umar Khattab Shaheed Razi was killed at Kilavaneri near Meesal. By the Pandiyas, the only one soldier left alive was injured brutally. But somehow he managed to reach Bouthiramanikkapattanam (Erwadi) and conveyed the message of Thiru pandiyan's invasion back to Madurai. Hazrat Sultan Syed Ibrahim Badshah was affected by this and sent a large troop towards Madurai. Before the troop could reach Madurai, the tough war at Madurai came to an end and Thiru pandiyan captured the throne back. Hazrat Sultan Sikandhar Badshah Shaheed rested at Thiruparankundram caves to worship and peace. King Thiru pandiyan was afraid of Hazrat Sultan Sikandhar Badshah and the Arabian forces surging back even after capturing the throne. So he was in search of Hazrat Sultan Sikandhar Badshah shaheed. Thousands of soldiers were sent in search, and finally they could see a rock flying up and settling down regularly in the Thiruparankundram hill and when they followed that, they saw an Arabian horse at the top of the hill which they confirmed to be of Hazrat Sultan Sikandhar Badshah. A few soldiers reached the cave where they found the rock to fly up while Hazrat Sultan Sikandhar Badshah stood for prayers and settle down when he was bowing down. One of the mal'oon from the soldiers of pandiya killed Hazrat Sultan Sikandhar Badshah Shaheed Raziyallah ta'ala anhu during his bowing down in prayers (while he was keen in praying Allah the Emperor of Emperors). Instantly the Pandiya soldier turned blind after the death of the Hazrat Sultan Sikandhar Badshah. The soldier begged and lamented for forgiveness after realizing that, this as a miracle of Hazrat Sultan Sikandhar Badusha and they agreed to do funeral of the Badshah. Hazrat Mustajab Ad Dua Sikandhar Badusha gave back the soldier vision as an act of forgiving him. As agreed, they did his funeral at the top of the Thiruparankundram hill with Islamic regulations. Disregarding of religion, from all parts of the Tamil Nadu and Kerala, people visit this Dargah. People who visit the Erwadi Dargah in Ramanathapuram district are supposed to visit this Dargah. By Syed Abdussalam Ibrahim Saalim Madurai Maqbara Hazrat many poems are written in praise of Hazrat Sultan Sikandhar Badusha. Since devotee's wishes come true very soon, he is called Mustajab ad Du'aa Sikandhar Badshah. Mustajab Ad Du'aa in Arabic translates as, a saint who's Prayers are immediately answered by Allah. Annually Urs festival of Hazrat Sultan Sikandar Badshah Shaheed is commemorated on the 17th night of the Islamic Month of Rajab every Hijri year. Thousands of people visit the Dargah at the hill top on this day.